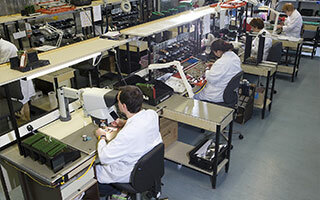 Briton EMS, a UK contract electronics manufacturer, is using the XJTAG boundary scan system to remove the guesswork from the test equation and rapidly pinpoint faults on complex and expensive printed circuit assemblies featuring high pin count ball grid arrays (BGAs). Briton EMS offers a broad range of electronics manufacturing services from printed circuit assembly through to complete product build, providing surface mount as well as conventional through-hole assembly. The company specialises in low to medium volume, high-mix production and also offers electronic and mechanical design services (hardware and software), prototyping, fulfilment and after-market services. Briton EMS works in partnership with original equipment manufac­turers (OEMs) across different markets including: broad­casting, industrial, instrumentation, medical and telecoms. The XJTAG system is used as a stand alone product and complements the company’s Ersascope BGA inspection system. The powerful and easy-to-use XJTAG boundary scan development system meets the growing market need for a cost-effective solution for testing tightly-packed printed circuit boards populated with JTAG devices such as BGA and chip scale devices, which cannot be tested by traditional methods. The XJTAG system has enabled us to remove the guesswork from the test equation and provides a way of rapidly and accurately pinpointing faults on boards that failed their functional test. These boards typically feature one or several JTAG devices, such as FPGAs, which are inaccessible to probes and oscilloscopes. Using the XJTAG system, we can now isolate a faulty device immediately and rework or reflow the failed component to rectify the problem. This saves us time and increases our yields. Contract electronics manufacturers (CEMs) are investing in boundary scan test equipment to overcome the challenge of testing tightly-packed printed circuit boards populated with an ever increasing number of BGA components. Briton EMS selected the XJTAG system – ahead of competitive products – due to its price, ‘plug and play’ capability, reusability of scripts, and because of the responsiveness and proximity of XJTAG’s technical support.